Q: My husband is a convert and our baby's blessing is coming up in two weeks. He's very nervous to do it in front of the congregation, and even more nervous that the baby will start crying uncontrollably during the process. Could someone write a post about how you are actually supposed to hold a baby during the blessing and give tips for how to successfully keep a baby from crying? A: Impending baby blessings have been known to keep modern mormon men up all night. We hope thoughts from Ken Craig, Max Power, Pete Codella and Saint Mark (all after the jump) help your husband rest soundly this week! Or, you can head here or here to see what Bishop Higgins has to say on baby blessings. Of all ordinances in the Church, a baby blessing runs the greatest risk of the person receiving the blessing pooping their pants at the most inopportune moment. Coming in second is high priests. My suggestion is to do the baby blessing at home. This is completely acceptable, as long as a member of the bishopric is in attendance, and he's not poopy either. The gathering is more intimate, with close family and friends who are understanding of the unpredictability of babies, as well as sensitive to the fact that it may be your husband's first time giving a blessing. Of our seven children, we've done three baby blessings at home. The only risk you run is a mother-in-law who will in most instances think it is a brilliant idea for you and your husband to take a few minutes to share your feelings about your new baby. And for me, the English language does not contain those kinds of words, so I always feel inadequate trying to express such happiness. One aspect of a blessing that I think is commonly misunderstood is the idea of preparing to give a blessing. Contrary to the notion that inspiration can only come in the very moment you are delivering the blessing, and especially in the case of blessings that are scheduled well in advance, I think it is perfectly appropriate (and perhaps even advisable) to prepare the content of the blessing in advance. I approach it much the same way I prepare for a sacrament meeting talk or a Sunday School lesson. In those cases, you would never say that someone is relying less on inspiration's guidance because he prepared his words in advance. In fact, failing to prepare in those settings will generally result in a less inspired talk or lesson in my experience. And so, I typically begin to prayerfully ponder well in advance of a baby blessing (or other planned ordinance) about the words I will speak in the blessing. Sometimes I only come up with broad contours of ideas; others I memorize entire portions of the blessing. (I have never brought written materials to the circle, although I don't think it is necessarily a terrible idea to do so.) Finally, regardless of what I have prepared, I try to be sensitive to inspiration that I inevitably will receive during the ordinance itself, and I adapt accordingly. An important element of any blessing is inspiration. And I think the earlier in advance you start seeking that inspiration, the better prepared you will be. My advice is to hold the baby next to you, cradled in your arms, and have the other brethren place their hands underneath your arms. You may also want to mention to them before doing the blessing that you don't want them to bounce the baby and that you're going to cradle the child. Then just pretend that you're offering a private prayer to Heavenly Father to bless your child. Sure you need to use the words specified for naming and blessing a baby to perform the priesthood ordinance, but it may help you be less nervous if you consider the blessing to be a conversation and opportunity for you to share some counsel with your child. 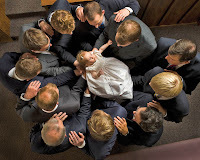 Of course, the baby won't remember the blessing, so it's really more of an opportunity for you to use your priesthood to outline for your family, relatives and the congregation how you anticipate your child's life to be lived. You'll do great! As a convert, I had never really been a participant in a baby blessing until I actually gave one. It was my friend's baby. He was a more recent convert and didn't have the priesthood at the time. He asked me to give the baby blessing. I was honored and overwhelmed. How could I give a baby blessing when I didn't really know how to do one? 1) Hold the baby how the baby wants to be held. If the baby likes to be cuddled, hold the baby close. If the baby likes to be rocked, rock the baby. Later, I made the mistake of rocking my youngest who hated it. He cried and made a big fuss. I knew I shouldn't have rocked him but I had a stake president friend in the circle who started the rocking and I felt awkward telling a stake president to "cease and desist his rocking." However, looking back, I should have told everyone before the blessing began what the baby likes and doesn't like. Prevention is the best cure and so is communication in situations like these. You fathers know your baby the best. Do what you feel is best for holding the baby. 2) Make sure you know the name you want to give the baby before the blessing. I heard a friend tell a hearsay story where a father changed the name of the baby during the blessing. His wife was not happy. Men, don't do this. Counsel with your wife before the blessing and be united. Remember, happy wife equals happy life. Unless you're the Prophet Joseph Smith and the Holy Ghost whispers "Mahonri Moriancumer" into your ear, go with the name you and your wife chose beforehand. 3) Think about your baby and his/her future life before the blessing. Now I know there are a lot of people who disagree with this suggestion and feel that you shouldn't think beforehand what you should say, but as a convert it steadied my nerves to ponder and pray before the blessing about my friend's baby and my own children. Insight and an outline of what I should say came to mind and it helped me to know the topics of what I should talk about. I'm not talking about verbatim but items like personality and characteristics, marriage and family, missions and stumbling blocks to look out for. When I approached the blessing purposely, I had a much more enriching and edifying experience. 4) Ask who you want to be in the blessing. I know there may be counsel out there to make it a small and intimate circle, but I like my friends and I like having the people who are important to me to be a part of this important, once-in-a-lifetime experience. So, I have had four people in a circle and I've had twelve. Ask those who are in good standing (and maybe those who are not) with the church to participate. The experience is spiritual and can bring us closer to Christ if we are deliberate and thoughtful about it. 5) Don't be embarassed. Babies are babies. They do baby things. They might coo during the blessing. They might cry. It's okay. Don't be frazzled. My friend's baby farted during the blessing. We laughed a little and continued with the blessing. Don't let a little flatulence faze you. 6) Invite non-members to it. A baby blessing is a great opportunity to have your non-member friends and co-workers to see what the Church of Jesus Christ of Latter-day Saints is all about. When my oldest was blessed, I invited students from the Jewish private school I was teaching at to come. Half a dozen or so came and it was a great way for them to see what my religion was about. When my youngest was born, I was a property manager of apartments and had become friends and acquaintances with many of my tenants. So, I invited about 100 of them to attend. Around 30 showed up and I was able to have more in depth conversations with them afterwards. Don't let a missionary opportunity pass you by, especially one as special as a baby blessing. 7) Ask your wife to jot down some notes. This was something my wife and I forgot. Thankfully, a thoughtful friend wrote down some of the words from our oldest's blessing and we were able to put it with our keepsakes from his younger years. It's hard to remember these things when the blessing happens but do yourself a favor and ask a friend to do it for you. You'll be glad you have it because you most likely forget what you say. Overall, just be yourself, be prayerful and pray for the Holy Ghost to guide you and He will.